Learn to cite sources in American Political Science Association (APSA) style. Cook Library has experienced librarians and library assistants ready to help, no matter where you are! Examples on this page are based on the American Political Science Association's Style Manual for Political Science. Remember, your professor is the final authority for bibliographic format, including the spacing of reference used in your paper. For examples of how to list government documents, legal citations, data sets, interviews & personal communications in a bibliography see APSA style manual. In-text citations are sometimes also called "Embedded Citations" or "Parenthetical Citations." You can cite within the text of your paper in several ways including within a sentence or at the end of a sentence. For a direct quote, include page number. All works cited must appear in the reference list at the end of your paper. Baker (2003) found that education was even more important than health care. Immigrants from Latin American countries have a complicated history in the United States (Suarez 2013). “Results from early research indicated that a stable government fosters democratization” (Smith, Fowler, and Evans 2003, 26). Use notes to explain or expand text or to clarify a table. Designate notes with sequential numbers and list them in an endnotes section at the end of the body of the text, preceding the reference list. 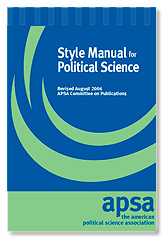 For examples, see APSA style manual.